Horsham Chess Club meets in the London Road Methodist Church Lounge just off Albion Way in central Horsham. 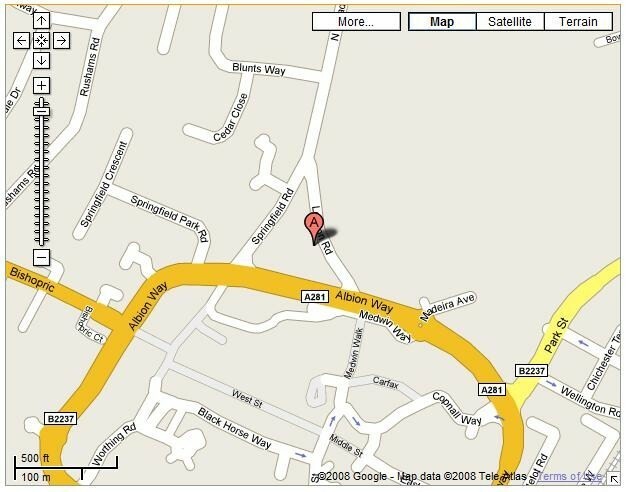 The postcode is RH12 1AN if you are using satnav, and a map is shown below. There is free parking in the Methodist Church car park at the front of the venue, and parking in the public car park behind the church is free by the time adult members begin arriving. The club night is on Tuesday evenings, except for our summer break in July and August. Junior chess club runs from 6:25pm-7:25pm and the adults then take over from 7:30pm-11:00pm. Post-match analysis is often in the Malt Shovel just over the road (not for junior members though...)!